We’ll keep it short and simple this week and jump straight into the comics, so here we go! Winslow was shown early on that life can be a burden to some. As weird as that seems, it became more and more true as Winslow’s recurring dream slowly began to take over his life. Eventually, dreams and reality were inseparable. Now, he’s in a psych hospital and it seems that there is something, or someone, else in his dreams. 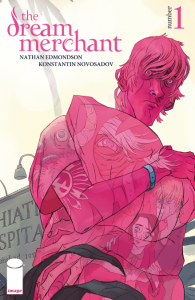 Even as a strange evil approaches, a mysterious man helps Winslow as he and a friend escape and go on the run. The first issue of Dream Merchant is absolutely colossal, weighing in at almost fifty pages of story. While it could’ve been split into two issues, it’s much more exciting and satisfying getting to read this piece of the story all at once. Nathan Edmondson is making something that reads almost like a legend or myth. It’s an interesting story and one that truly will be told on a grand scale. The art from Konstantin Novosadov also makes me think of illustrations from old books of legends (it might be the noses, honestly), which further cements the mythic feel of the book. The two come together to make a story that is new and exciting, while also playing with some classic archetypes. Honestly, this might be the next big thing from Image. It’s well written, beautifully drawn, and has a story that’s all its own. Edmondson has already created some pretty successful comics with Image, and I believe this one will follow right along with the rest. New readers should definitely get into this as it’s a completely new series and is also a fantastic value, as the issue is gigantic. It’s just a great overall comic, content and costwise. Parental Concern: Mild. Some weird, crazy supernatural violence. 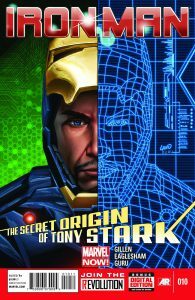 After the startling reveal in the prologue, Tony Stark is still trying to make sense of things. But this issue is more about what came before Tony. After learning that his unborn child likely won’t survive, Howard Stark assembles a group of friends, including Dum Dum Dugan and Thunderbolt Ross to help him in breaking into a casino ran by aliens and freeing the robot intelligence that might have the key to saving his unborn child. Needless to say, it’s not quite how Tony remembers things. Kieron Gillen and Dale Eaglesham building the mythology of Iron Man even further. They’re not only expanding his universe, but also his origins. Gillen’s story is fun, but also well written. The Ocean’s Eleven style teamup that Howard gets together is a bit absurd, but somehow makes sense in a weird way. Eaglesham’s art gives Tony a distinct look and his work on the flashback sequences is great. Even Thunderbolt Ross’ mullet. This is the official start of the arc, but reading issue 9 likely would be beneficial. Even so, I’ve forgotten about half of what happened last month, so it can’t be that crucial, right? Regardless, jump into some crazy Iron Man stuff. Plus, you got some Red Hulk mullet from back in the day. Parental Concern: Miminal. The teeniest bit of mild swears and implied violence. A giant solar flare sweeps across the Earth and burns the planet alive. The only humans lucky enough to escape the travesty are those aboard an orbiting space station. 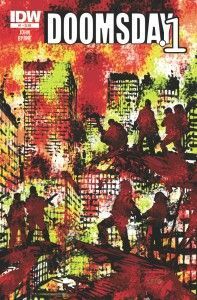 As the international crew lands on the charred planet, they seek to see what’s left of humanity and civilization on the day after doomsday. John Byrne both writes and draws this comic, which seemingly helps him make sure the idea gets to the page correctly. The idea itself is interesting. Having a group of people be completely spared from a global apocalypse because they were in space is singularly interesting. The shadowy people shown throughout the issue also set up some conflicts and raise a lot of questions about what will happen next. While it’s a very cool idea, Byrne’s execution on it was a bit flat, so far. The conflict amongst the group seems a bit forced. In future issues, it surely could be better. The art, on the other hand, was quite good. From the control panels on the spaceship to facial expressions, Byrne accentuated the little details that helped to make the story a bit more “real”. All in all, it’s certainly not a bad comic. It’s worth a read and could be great for a new reader that loves post-apocalyptic stories and wants to stay away from the superhero genre. Parental Concern: Mild. Some violence, and the whole “Earth being incinerated” thing. After an Olympian war and a prophecy, Wonder Woman must continue to protect a demigod child who threatens the throne of Mount Olympus. As the conflict grows, more and more Olympians join the fray, putting the odds ever against Wonder Woman. As Apollo gloats of his victory, Wonder Woman must protect Zola and the baby from Artemis, who has been sent to kill it. Diana uses Artemis’ own strength to beat the goddess as she continues on her way to protect the child. During the fight, Zola, Lennox, and the child run away, only to be stopped by Cassandra and a nameless man, both of whom plan on killing the child. 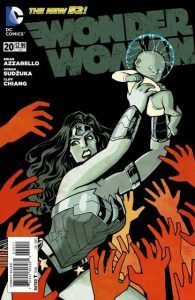 Brian Azzarello has made Wonder Woman a title that is one of the most consistently underrated comics on the market. While Batman gets all the love, this title is steadily building a world and reinventing mythology (sometimes quite literal mythology) with great effect. The art from Cliff Chiang has always made it look great and gave Wonder Woman a look that was not only gorgeous, but bold. It’s a great run so far. This issue is not so great for new readers. While there is some background on the events, very few characters or events are adequately explained. While it’s a great issue of a great series, it’s not right for a new reader. Pick up the other 19 issues, and then jump in. Parental Concern: Mild. Violence, attempted murder. I been a Iron man fan for years . Read the whole series . From 68 till now was getting a little tired of the same old story , but this recent issue gives me some hope for the current run . Actually enjoyed this issue . Not sure if 451 is playing mind games on Tony but it’s making for a good story line , loved the whole grey’s and aliens and area 52 stuff . Looking forward to the next issue . John out. Thanks for sharing! I missed Doomsday.1, and thanks to you I now have something fun to read heading my way in the mail!